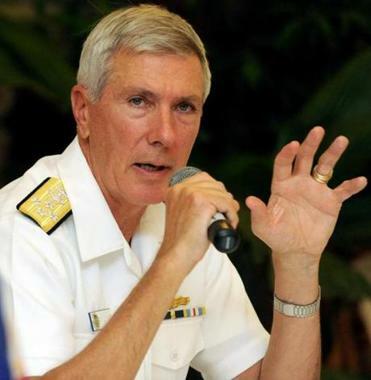 Admiral Samuel J. Locklear III met privately with security and foreign policy specialists at Harvard and Tufts universities Thursday and Friday. CAMBRIDGE — America’s top military officer in charge of monitoring hostile actions by North Korea, escalating tensions between China and Japan, and a spike in computer attacks traced to China provides an unexpected answer when asked what is the biggest long-term security threat in the Pacific region: climate change. Locklear’s two-day visit to New England, which included meetings with students at the Naval War College in Newport, R.I., coincides with the Obama’ administration’s recent “pivot” to Asia — the recalibration of national security strategy after more than decade of war in the Middle East to reemphasize a region with rising military and economic powers such as China and India and where most US trade links are. In closed-door discussions Thursday and Friday, Locklear met with security and foreign policy specialists, including the Harvard Kennedy School’s Graham Allison, who directs the Belfer Center for Science and International Affairs, and Asia specialist Joseph Nye Jr..
Nye said he briefed Locklear on a trip he made last fall at the behest of the Department of State to meet with the top leaders of China and Japan to urge them to peacefully settle the disputes over islands in the South and East China Seas. China last month was accused of directing one of its navy radars at a Japanese warship near the islands where both countries assert sovereignty and claims to fishing and mineral rights. It came several weeks after Japan said China took similar action with one of its military helicopters. “We have an ongoing number of disputes,” Locklear said. “It is not just about China and everybody else, because there are disputes between other partners down there, too. Sometimes I think the Chinese get handled a little too roughly on this. A larger concern is North Korea, which in recent days has threatened to launch a nuclear weapon against the United States. Following Pyongyang’s recent long-range missile launch and underground nuclear test, the United Nations Security Council on Thursday voted unanimously to tighten sanctions on the reclusive Communist regime. In response the North Korean government threatened to nullify its nonaggression pacts with South Korea, where the United States maintains a military presence. Locklear said North Korea’s military has taken recent steps to “visibly increase their levels of readiness” along the demilitarized zone that has separated the two Koreas since the armistice halting the Korean War in 1953. “We are watching very closely what’s going on and we are prepared to defend the alliance as well as our homeland,” he said. “We made cyberspace as kind of an ungoverned territory . . . and we haven’t been able to get our arms around how to govern it yet,” Locklear added. But when it comes to pragmatic military planning, Locklear said he is increasingly focused on another highly destabilizing force.